Molly, our first Dane is a chocolate merle. 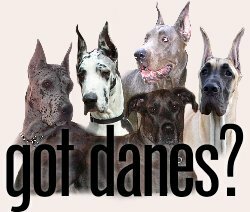 Athena, a gorgeous merle, is our second Great Dane. Coda was the next to come, since it was at that point that we realized we would like to do some showing and bought her from Elan Danes. Phantom was meant to be ours. He was born on the day we closed purchase of our first house and came home with us 8 weeks later. Cropped by one of the best in the country, he has a handsome head and a disposition to die for. And our latest addition is Phoebe, who we imported from Foaldown Kennels in England in October of 2002. 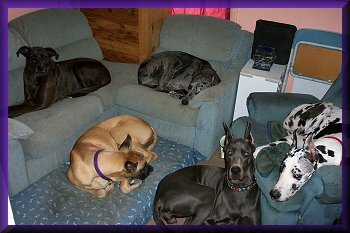 Be sure to check out the links on the left to see each of the dogs’ individual pages. There are also pages on the left for the Breed Information, Therapy Dogs, puppy info, carting, and pets who have passed on. We feed our dogs and cats an all natural raw diet. I have added a page about raw diets and what we prefer. You can find that link at the top of this page.